It's Halloween night, and it's up to Scary Godmother to show one little girl just how much fun spooky can be! Meet Hannah Marie, who, with the help of Scary Godmother, stands up to her mean-spirited cousin Jimmy and her fear of monsters on her first Halloween adventure with the big kids. Later, Hannah joins forces with Orson, the vampire boy, to unravel a mystery near and dear to their hearts. Some of Scary Godmother's closest (and most frightful) pals get in on the fun too, including Bug-A-Boo, the Boozle, and Skully Pettibone. *Four of Thompson's Eisner Award-winning, fully painted children's books are collected here, in their entirety, for the first time (Scary Godmother, The Revenge of Jimmy, The Mystery Date, and The Boo Flu). This deluxe edition also features some of the earliest concept designs for this haunting and imaginative series. 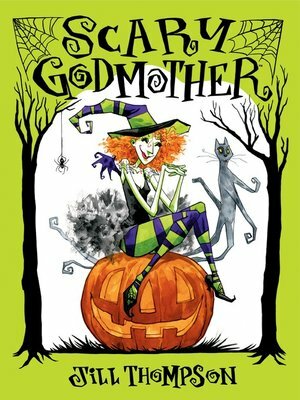 *Thompson's Scary Godmother series resulted in a successful stage show and two animated specials shown on Cartoon Network, Scary Godmother: Halloween Spooktakular and Scary Godmother: The Revenge of Jimmy.